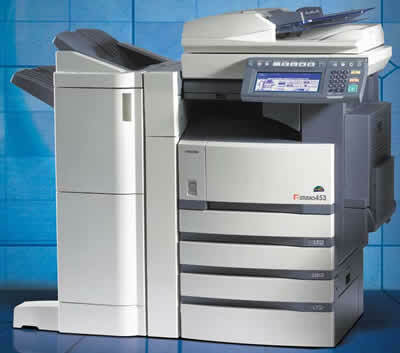 Refurbished Toshiba copiers for sale. Our sales and service team covers Southern California, Inland Empire, Los Angeles County, Orange County, Riverside County, San Bernardino County. Tandem Series are top performers. 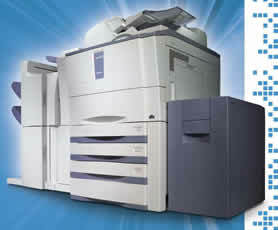 Print and copy speeds are 52, 60 and 72 pages per minute, respectively. 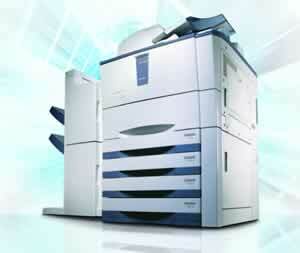 All units scan 71 originals per minute at 600 dpi and are even faster when scanning to file at a lower resolution. With 100% duplex productivity, no time is lost while paper is inverted. And an impressive warm-up time of just 130 seconds along with a 30-second recovery from standby helps reduce wait time. The e-STUDIO520T/600T/720T Tandem Series utilizes a special tandem drawer configuration for greater flexibility. Two 500-sheet drawers are combined with a lower, built-in large capacity drawer that holds two stacks of 1,250 letter-size sheets. When the right stack of paper runs dry, the left stack is shifted over and used, without interruption, in order to help make short work of long jobs. e-STUDIO523 and e-STUDIO603 are packed with all the power and the features needed to keep an entire business running smoothly and efficiently. 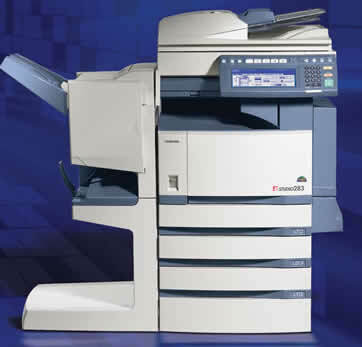 the e-STUDIO233/283 also provide the flexibility to grow as your workflow changes.